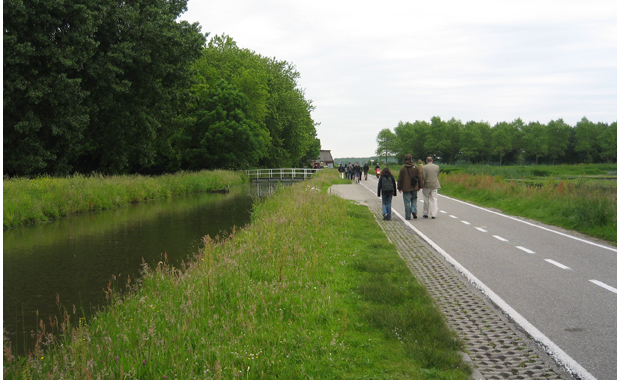 Intermediate Landscapes are consistent, functional and environmentally coherent areas made possible with specific tools and knowledge at the local to regional level. Developed and developing nations currently face an important challenge in urban design and planning: the management of intermediate landscapes triggered by the increased mobility and unprecedented urban growth. Standard planning cannot guarantee the efficiency and environmental quality of these new urban systems and open spaces. These landscapes, by their size, morphology and use, question the very notion of the compact city, as well as our common urban practices. The need to regenerate the large suburban growths, the shopping centers and commercial strips; or to preserve agricultural land and river banks, strongly arises in our metropolitan regions. All these episodes no longer respond to local government boundaries, but to ad hoc constraints of functional, morphological or environmental character. For this reason, intermediate approaches, those between the local and regional level, are therefore needed to resolve conflicts and develop new opportunities. The Master in Regenerating Intermediate Landscapes is devoted to providing the tools and methodology required to address these needs. This program is based on traditional core values of European planning, specifically: the concern and promotion of local identity and environmental values and the commitment to social equity. This program integrates current research by international experts into a comprehensive approach where economics and management combine with ecology and culture. Through the training of skilled technicians this program seeks to answer some of the most challenging and urgent needs in urbanism. Among these are the regeneration of sprawl, the transformation of intercity roads into civic axes, and the preservation of cultural landscapes. Since the eighties, critical answers were being formulated in Europe and North America in response to environmental, economic, social and cultural challenges arising as a result of an unplanned and uncontrolled urban growth. We can confirm that at the present time there are sufficient theoretical and professional grounds to develop a coherent alternative model. In this context, the Master in Regenerating Intermediate Landscapes intends to contribute to the construction of more efficient and sustainable metropolis. Skilled methodological training in the regeneration of intermediate landscapes by means of their analysis, interventions, and integrated management. Scientific training based on the latest international research, which ranges from a global vision to a focused and specific knowledge. Opportunity to access, through field work knowledge of detailed model initiatives of local regeneration. A chance to gain a technical awareness of social balance, a rational use of resources, and the preservation of a local identity. Holders of university degrees in the following areas: Architecture, Urban and Regional Planning, Urban Design, Landscape, Urbanism, Civil Engineering, Geography, Urban sociology, Environmental Studies. The programme will be taught from October 2014 to July 2015 (1 academic year) / 60 ECTS credits. WORKSHOP IN BARCELONA. Case study module and Master thesis module. From May 2015 to July 2015. Workshop and lectures. Lectures on Mondays, Tuesdaysand Wednesdays; Workshop on Thursdays and Fridays. Classes will be held at the Iradier-Barcelona Campus. And i am glad studying your article. But wanna remark on some normal issues, The website style is great, the articles is actually excellent : D.